The British Library is home to the nation’s Sound Archive, an extraordinary collection of over 6.5 million recordings, from the 1880s to the present day. In 2017, the Library received a significant grant from the Heritage Lottery Fund to support a major digitisation project, Unlocking our Sound Heritage: an initiative that will help save the UK’s sounds and open them up to everyone. While years of digitisation have produced robust preservation workflows, such a major project presents a challenge: how to preserve complex audio objects at scale while enabling access to collections in a streamlined way. This paper will describe the challenges that marrying the requirements of preservation and access presents, and the solutions the British Library has developed. It will describe the approach the Library has taken towards creating structured metadata for sound recordings in METS, through to the creation of a new framework for access to digital audio online – IIIF v3 – and the introduction of a new open-source player for audio on the web. BBC Wales will be relocating to new premises in central Cardiff in 2019, where we will be among the first broadcasters in Europe to implement fully end to end digital broadcast workflows. Preparations for the move include digitising BBC Wales’ extensive audiovisual, audio and film collections. Working with colleagues from BBC Archives and the BBC Design and Engineering team, the collections were digitised in 2 years and now reside in BBC Digital repositories. 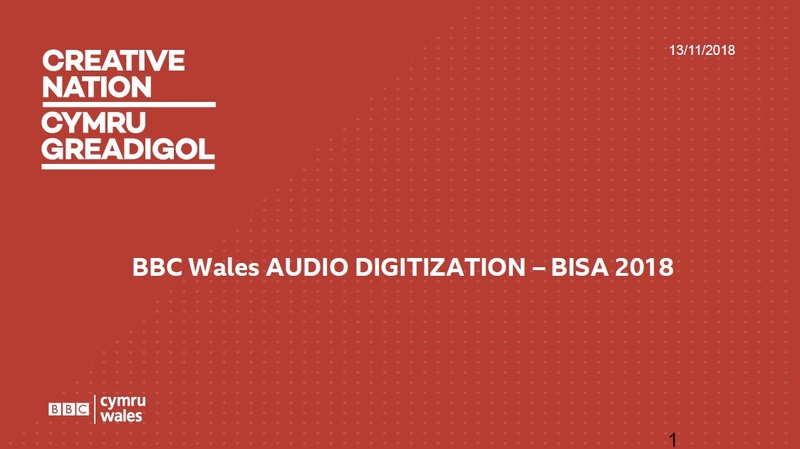 For the first time ever, the BBC’s internal and external production community has direct access to BBC Wales’ entire digitised collections and we are proud of this achievement. The audio collection spans over 90 years and includes a variety of formats, including quarter inch, DAT, MiniDisc, CDs, and includes radio output in Wales in both English and Welsh across a range of genres - news, sport, drama, current affairs, schools and education programming – it truly is the soundtrack to the lives of people in Wales over the decades as key events such as Aberfan and the Investiture unfold. We also have exciting plans for developing public access to the content now that it is available in digital formats. We will share details of how we approached the challenge, including the use of innovative technology methods, the task of coralling inconsistent and often incomplete metadata. We will also address the impact the digitisation is having on the role of the archivist as we move towards a “self-serve” archive model, potentially relying more on technology than people. For years the RCN has been known as the Voice of Nursing in the UK because we represent and support the nursing profession. Since 1986 this has included an archive service and an oral history collection. One which has grown to include all aspects of the work of nurses across the UK during the events of the twentieth, told through their personal experiences. Originally recorded on analogue magnetic tape cassettes, the collection carrier has moved to digital through minidisks to using digital recorders and SD cards. We have already completed a digitisation project in 2011 creating digital copies and full transcriptions of these recordings, but that isn’t the final step. Now the archival world is focussing more keenly on digital challenges we at the RCN archive need to ensure our oral history collection is brought into the twenty-first century alongside our vital business archives. The RCN uses Preservica digital preservation software based in the cloud for its archival needs. Our small team began this work in 2017, but oral history interview files have not yet been moved into the repository. Our plan over the next few years is to work on simultaneously moving them into the repository and on upgrading the catalogue information we have available to researchers. I firmly believe that this will improve both preservation and access and that you simply can’t do this work separately if we expect to become the Digital Voice of Nursing for the future. During a recent collaborative project supported by the Rutherford Fund between March and June 2018, several collections of historical sound recordings from South Asia found their way back from the British Library Sound Archive to the Archives and Research Center for Ethnomusicology, New Delhi. These included the Madras Museum cylinders (1909), the Baluchi cylinders (1911), the Linguistic Survey of India gramophone records (1913-1929), and documentation of the Fox Strangways (1910-11) and Arnold Bake collections (1931-34). 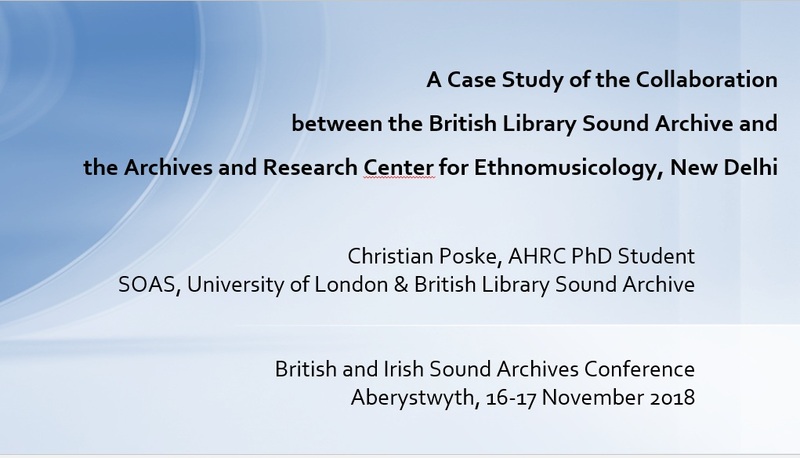 Synergising subject-specific expertise and skills, staff of both archives shared overviews on holdings, undertook exchange visits, familiarised themselves with cataloguing systems and workflows at the other institution, explored collections, and aided the evaluation of recordings. While Sound Archive staff was responsible for the evaluation of historical collections and the subsequent transfer of copies, ARCE staff contributed to the digitisation project Unlocking Our Sound Heritage through work with other recording collections, and provided information on classification systems for South Asian musical instruments. This paper discusses the benefits and challenges of the project, and how its outcomes were communicated to the public, serving as a reference that could aid the planning of other international collaborations. 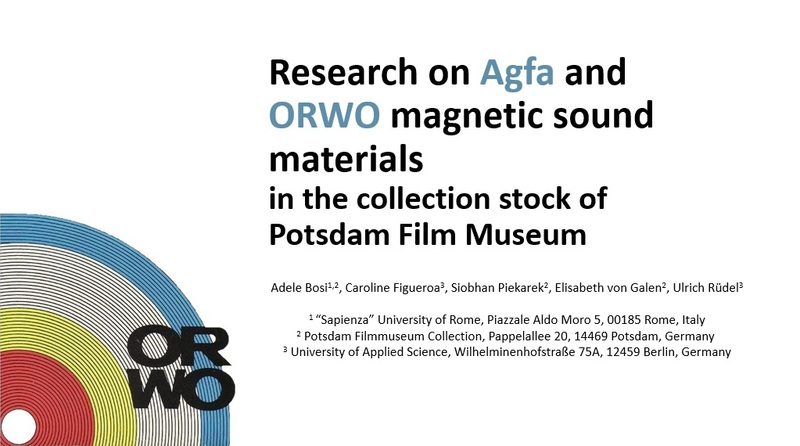 The research started from observation of strange odor occurring in some Potsdam Film Museum stock rooms, which contain magnetic tapes, like Agfa and ORWO ones, produced during DDR, when lack of equipment due to separation of Germany hindered production processes and poor-quality materials were likely used. The aim of the work is to understand present tapes composition and how to act. For that, a pursuit in recipes archive in Wolfen Film Museum, where Agfa and ORWO products were made, is being undertaken. 15 different tape types have been found in Potsdam Film Museum stock. Wolfen Film Museum archive research has allowed the understanding of their composition and their production time-periods . Thus, letters, recipes and confidential documents report about several material experiments made especially during 50s, right after separation of Germany. Types present in Potsdam Film Museum’s stock are both in cellulose acetate and in polyester. While cellulose acetate suffers from the well-known “Vinegar Syndrome”, polyester magnetic sound materials suffer from hydrolysis and “Sticky Shed Syndrome” of poly (ester-urethane) (PU) binder. It is not clear how the two phenomena are related, but they seem to occur as different chemical mechanisms . Being hydrolysis catalyzed by acids, PU shouldn't likely be stored with acetic acid produced by cellulose acetate “Vinegar Syndrome”. These decay processes lead to a loss of tape information, making them unplayable in a long term. For that reason, mechanisms and causes need to be further understood to have a better comprehension of the problem and to develop a suitable conservation strategy. Avoiding the loss of a big amount of precious cultural heritage present in archives, or at least trying to save them until digitization, is the final purpose. Musicology is a relatively recent discipline that borrows from other disciplines as acoustics, psychology, philology, sociology, anthropology, and library science, the methods, techniques, and terminology, so it is seen as a deeply interdisciplinary discipline. However the musicologist is simultaneously a listener and a composer, since analysing a musical piece implies "rewriting" it. This is particularly difficult for contemporary music, since this kind of music does not rely only in the score. Contemporary music may involve several components as scores, scripts (containing scenic elements or other specific indications), audio, slides, texts, or other documentation. In order to complete the analysis of a contemporary music work, the musicologist needs to access several tools from Digital Libraries: graphical representations (scores, sonograms, or formal schemes); audio or symbolic representations (MIDI, computerized description of the score, and so forth). Digital Libraries provide musicologists with knowledge from bibliographical references, scores, or audio, but do not cover the musicologist purpose, since the information is still not systematic, so the communication system should be improved. Digital Libraries, through virtual collaborative spaces, should combine, inquire, store, and re-use different knowledge representations, this would help not only musicologists, but also the research community, aiming to enrich their scientific communication. In this paper we will address some music-theatre works that include tape recordings, composed by Constança Capdeville, whose collection is currently stored at the Portuguese National Library, aiming to understand what documentation strategy do we need to develop/adapt to improve their access, so that such works can be represented again. 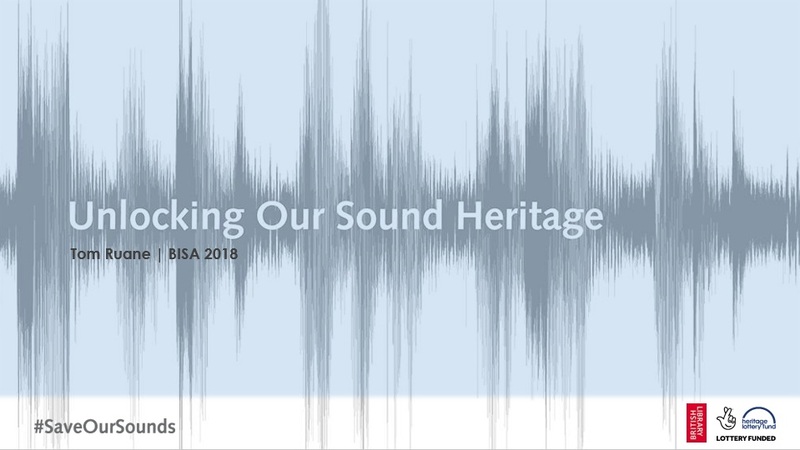 One of the primary aims of the British Library's ambitious Unlocking Our Sound Heritage project is to establish 10 digitisation centres across the UK with an aim to preserve at-risk audio collections held in their regions. As one of a team of four Trainer Engineers tasked with setting up the digitisation studios, the focus¬ of my paper is to provide an 'on the ground' report of the current progress we've made and provide a practical breakdown of the requirements and challenges setting up a digitisation studio for audio preservation. The regional partners chosen for the project cover a broad range of organisations from Universities to local Record Offices, because of this our approach had to be simple and flexible. 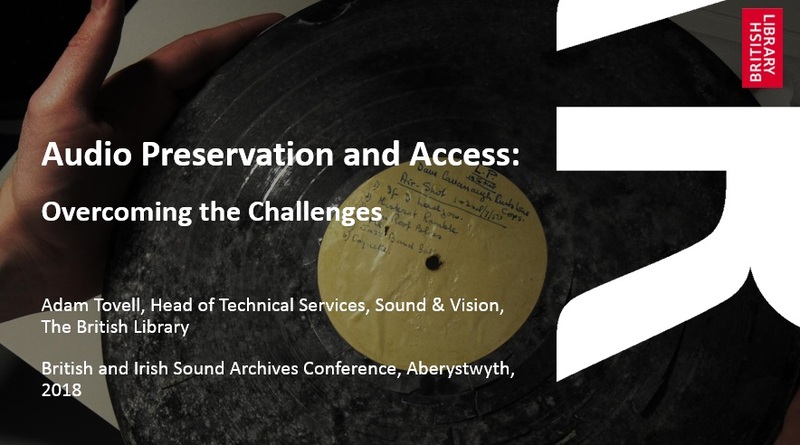 The paper will look at the studio's design, discuss the issues faced sourcing enough legacy playback equipment and breakdown the digitisation workflow, including the technical infrastructure for securely delivering the digitised content to the Library's digital repository. We've made big gains so far with seven out of the ten studios in-place, and by the time of this year’s conference all the studios will be up-and-running with engineers in-place to start the work of actively preserving content. These are still the early stages of the project and our ongoing task is to develop the skills of our partners and empower them to continue the outreach work in their regions, as experts in the field of audio preservation. This paper will focus on a digital preservation project undertaken this summer at the British Library Sound Archive comprising of sixteen instantaneous lacquer discs. It will outline the transfer workflow and demonstrate the sonic effects of various styli upon the discs. 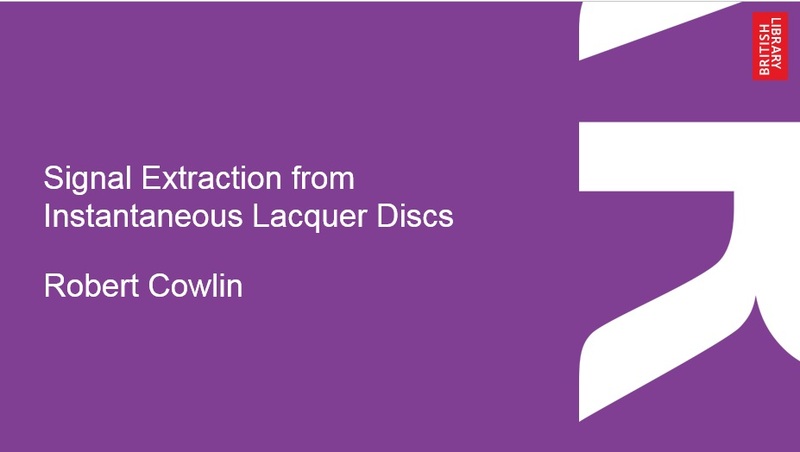 Lacquer discs pose a high preservation risk due to the instability of their sound carrying layer. Consequently, there is an urgency to transfer them to digital files before they are lost. However, in one’s haste to preserve these fragile artefacts, it is perhaps tempting for conservators to forgo crucial steps that would otherwise improve the overall sound quality of said transfers. One such element is the selection of a stylus that reduces or potentially eliminates the characteristic sonic intrusions associated with lacquer disc playback such as clicks and distortion. For this project, a great deal of time was spent auditioning various stylus sizes and profiles. During this stage it was found that approximately two-thirds of the collection responded well to microgroove styli despite having been cut during the coarsegroove era. When a microgroove stylus was successfully able to trace the groove the output was consistently better than the best coarsegroove alternative, producing lower surface noise, less to zero tracking distortion, and a fuller sound.